The property is located in one of the Chiltern Hills most beautiful valleys in a quiet rural setting. Originally built as a wing to spectacular 18th Century barns, the stables have been converted to a very high standard, retaining many of the original features. Well equipped, the property provides comfort & convenience whilst enjoying privacy in its own walled courtyard with vines and colourful plants.The setting is rural and peaceful with our ducks and chickens wandering freely. The area is a walker’s paradise with the famous Ridgeway nearby for the serious or several delightful walks on the doorstep for the more casual. Also popular with cyclists. Excellent base for touring the ancient Thames-side towns of Henley, Wallingford, Dorchester & Abingdon all within a few miles. Oxford (c12 miles), Windsor (c24 miles), London (c45 miles), Stratford Upon Avon (c48 miles), Cotswolds (c25miles). Close to rail links to London & West country, 10 miles from M4 & M40, Heathrow 28 miles. Horse riding, golf, boat hire available locally. If you are a fan of the TV series Midsomer Murders, check out the filming locations on www.midsomermurders.org, to see the many pretty villages that are local to the cottage! The property is strictly non smoking. Washing Machine is a washer dryer. For drying purposes, maximum load must be half size. There is a settee and 2 separate easy chairs with the tv and dvd player. Books and board games are provided. A large selection of books are available, mainly for adults but there are some children's titles. An enclosed courtyard is immediately outside the cottage for private entertainment. Boats can be taken from Wallingford or Henley on Thames for organised river excursions or for small boat hire. Very comfortable in beautiful surrounds. Loved the week we stayed here. Very grateful for allowing us to stay with our dogs, who enjoyed all the footpaths and forest walks. Lovely unique refurbished stables. We were delighted to have you and your dogs were no trouble at all. We wish you success in your home search. I hope the house in Solihull works out for you all. Well equipped cottage in a lovely, quiet, rural location. Ideal for our purpose of catching up with friends who live in the Berks/Bucks/Oxon area. Jenny & Robert were excellent, thoughtful hosts and made us very welcome. We enjoyed a very comfortable week in this lovely cottage. It was perfect for the two of us, but had space to sleep four if needed. We slept in the upstairs bedroom, accessed via a steep staircase (wouldn't suit anyone with limited mobility), in the super-comfy, very large, zip and link bed. The room itself is very spacious, and has plenty of storage space. The second bedroom is in a converted stable, with its own bathroom, and lots of original character and features. The living room has a wonderful log fire, which came in very useful at this time of year. Plenty of kindling and logs were provided by the owners, along with instructions on how to use the fire for anyone not familiar with them. 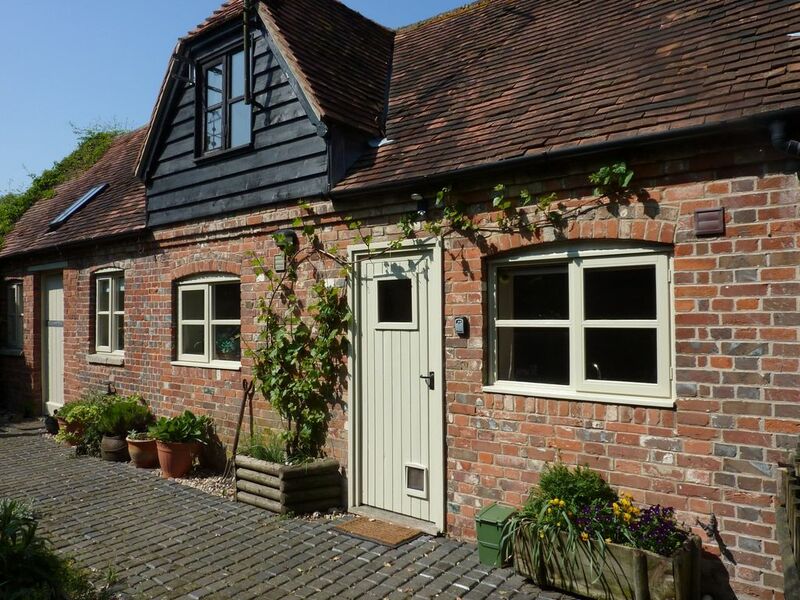 The cottage is attached to the owners converted barn, set in beautiful countryside at the end of a long, quiet country lane. It couldn't be more peaceful ! All in all, we had a most enjoyable stay, and would love to return. It was great to meet you all especially with the connection of the Frasers! I hope we see you again to hear about the new grandchild! Excellent overall. A perfect break. The property is perfectly situated in a beautiful location. Very peaceful but close to many attractive places to visit. The hosts are very welcoming, friendly and helpful and the property is delightful, well organised with lots of character. One of the best breaks which we have experienced. A real delight to have met you both. We really enjoyed you staying with us and that you visited all the local sights and NT properties. Please come back and see us....we’d love to see you! We sat in the walled garden and all you could hear were the birds singing. Very Relaxing. The "old stable" is of a very high standard. The D/S bed room has to be seen to be believed. If you enjoy walking and taking in the vast scenery this is for you. We were made to feel welcome. Pub welcoming as well. Very peaceful. Thank you for your kind words. It was lovely to meet you and your friends, I'm sorry we weren't around to say goodbye. I hope the golf went well on Saturday and your friends are enjoying the canal boat - the weather has at least picked up! Wellplace is a small hamlet near Ipsden, itself a small village, about 5 miles east of the historic market town of Wallingford. Wallingford is about 10 miles downstream of Oxford. The cottage is located in an area designated as of outstanding natural beauty. Our visitors find the cottage an ideal base for exploring the rich history in the area, and trips to London, the Cotswolds,and Shakespeare country.